North Korea has fired a ballistic missile, which reportedly passed through Japan’s airspace near Hokkaido, triggering a public alert. It's believed to have fallen in the Pacific Ocean some 2,000 km east of the island. “North Korea fired an unidentified missile eastward from the vicinity of Pyongyang this morning,” the JCS said. The missile reached an altitude of 770 km and covered a distance of 3,700 km before falling into the ocean, according to South Korea's military. 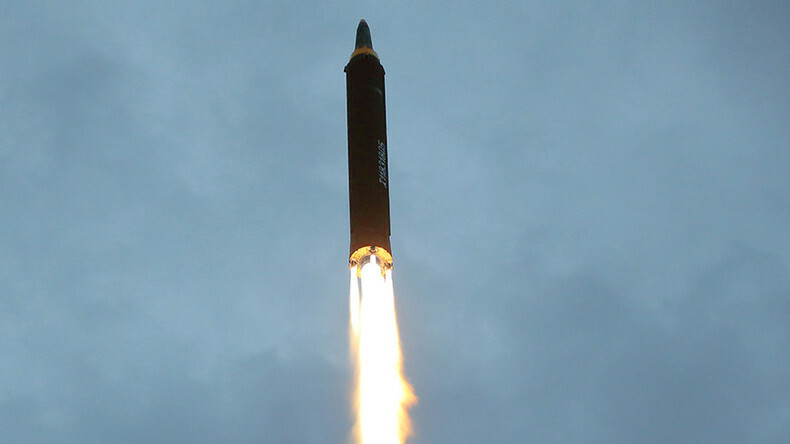 The South Korean and US militaries are analyzing details of the launch, Reuters reports. NHK Television urged residents in Hokkaido and Tohoku regions to take shelter as the projectile passed over Japanese airspace near Hokkaido at around 7.06am local time. — azusa tanaka (@azusata) 14 сентября 2017 г. The Japanese government will hold an emergency national security council session in response to Pyongyang's latest launch. Japan’s Chief Cabinet Secretary told reporters the missile was likely “the same as before,” referring to the August 29 launch over Japan. Yoshihide Suga condemned Pyongyang’s missile test “in the strongest words,” saying the missile passed over Hokkaido and fell into the Pacific Ocean, roughly 2,000 kilometers east of Arimori Cape. The Japanese government did not try to destroy the missile, according to reports. There's been no news of damage to aircraft and sailing vessels, or falling objects onto Japanese territory. Japan's Prime Minister, Shinzo Abe, however, issued instructions to prepare for unforeseen circumstances by communicating prompt and accurate information to citizens. The North Korean launch comes shortly after South Korea staged a ballistic missile training drill in the Sea of Japan. The South Korean president has been notified and has immediately convened a National Security Council meeting. #NewsMap#NorthKorea's missile landed 2.000 km east of #Hokkaido. Just prior to the launch, Pyongyang warned that it was time to “annihilate” the US, to “sink” Japan and to “wipe out” South Korea following the adoption of a new UN Security Council sanctions resolution this week, in response to the regime’s recent nuclear test. The 15-member United Nations Security Council (UNSC) unanimously approved a new round of sanctions Monday, targeting North Korea’s textile exports and its oil imports. On August 29, North Korea launched a ballistic missile over Northern Japan. The Hwasong-12 intermediate-range ballistic missile is believed to have flown about 1,700 miles (2,735km) and reached a height of 341 miles (548km) before falling into the Pacific Ocean. After a number of last minute compromises, China and Russia supported the latest round of sanctions against Pyongyang Monday. While strongly condemning North Korea's actions, Moscow and Beijing continue to insist on the implementation of the so-called “double-freeze” proposal, which calls for Pyongyang to suspend its nuclear and ballistic missile tests in exchange for a halt to joint US-South Korea military drills. Tensions on the Korean Peninsula are rapidly mounting with North Korea defiantly continuing its missile and nuclear tests and the US, South Korean and Japanese militaries regularly holding drills in the region, accompanied by strong rhetoric by Washington. Pyongyang says the boosting of its missile and nuclear program is justified as its only means of defense should these military maneuvers escalate into a direct confrontation.